Previous tool　required additional costs to be paid during each expansion. Had to make judgments based on human sensed because of misdetection. Monitoring of a dual-stack network with both IPv4 and IPv6. The introduction cost is low and additional licensing fees do not need to be paid whenever the system is expanded. Many introduction results,include large-scale systems. Complete the construction in a short time with using templates. Fine adjustments reduce misdetection and help to understand the problem occurred devices intuitively. Fukuoka University, which has its campus in the southwestern part of Fukuoka City, is a prominent university in West Japan that has 9 departments, offers 31 subjects, and has more than 20,000 students studying there, and this university has been dispatching talented individuals into the world while continuing to play a vital part in its local community. The system that provides a comfortable network environment at this campus in order to accomplish the role of being the infrastructure for educational and research activities is the educational/research system “FUTURE5” (Fukuoka University Telecommunication Utilities for Research and Education 5th generation). As can be understood in the “5” in the name of this system, the current system is operating in its fifth generation. From the year 1994, a year in which Internet connection environments were still rare, a system was quickly constructed at Fukuoka University, and it has been used as an education and research environment ever since. While incorporating elements that had become necessary at the time of their incorporation, such as improvements in the network speed, the adoption of a wireless LAN environment, the utilization of cloud services, and the strengthening of security countermeasures, large-scale updates have continued to be made approximately every five years until now. In the newest version, FUTURE5, with the system that was used until now as a base, various new tests were incorporated. For example, Windows 8.1 environments were provided as client systems, co-operative education and training in which tablet devices are used was introduced, the wireless LAN environment was expanded, and security was improved. 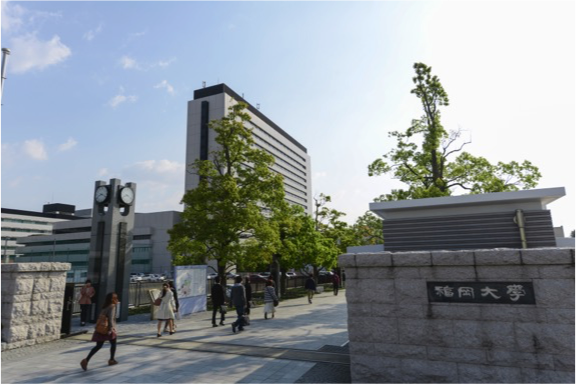 This network began operation in September of 2015, after approximately 200 wireless access points were installed in East Japan’s largest campus network in which approximately 10,000 PCs are connected. Professor Masaru Okumura, the head of the Research and Development Office of the General Information Processing Center at Fukuoka University, the center in charge of design, prior inspection, and operation monitoring of FUTURE5 after it had been implemented, said that FUTURE5 is “designed with the concept of undisrupted operation in mind”. This is because FUTURE5 is responsible for the entire campus network including administrative operations. When a problem occurs, classrooms and research activities are majorly affected. Therefore, working to improve system reliability by providing redundant devices and network pathways and by decentralizing machine rooms, and by using monitoring to quickly detect problems that occur, it is possible to provide services of stable quality to all persons on campus. In order to create such an “undisrupted network” at Fukuoka University, Zabbix has been adopted. Even in the successive generations of the FUTURE system, naturally, system monitoring was performed in order to allow for stable operation. However, even during the time between the large-scale updates that were performed in five-year units, small expansions and additions were made to the system. One problem was that the commercial system monitoring tools that had been used previously required additional costs to be paid during each expansion. 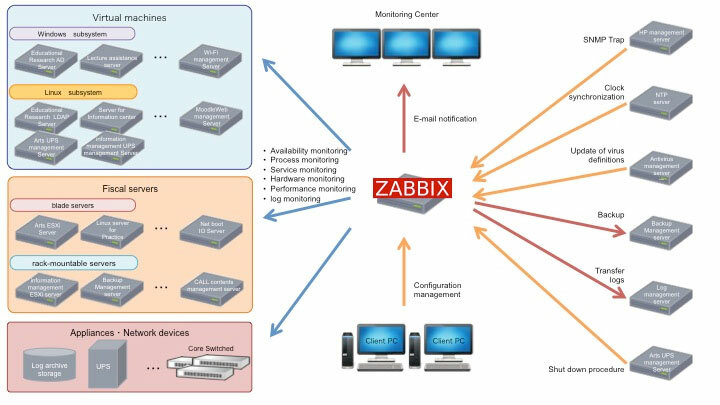 At that time, the monitoring tool that was suggested by Internet Incentive Japan (IIJ) was Zabbix. It was stated that, because the system is based on open source software, the introduction cost is low and additional licensing fees do not need to be paid whenever the system is expanded. Also, the selection of this system was supported further because there is an abundance of information regarding Zabbix, there are many introduction results, particularly in large-scale systems such as data centers, and because the performance is reliable. In addition to network devices from multiple vendors such as Cisco Systems and Alaxalia Networks, FUTURE5 also consists of virtual bases such as VMware, as well as multiple security devices. Additionally, a variety of services such as NTP servers, Active Directory, and VPN, are operated, and all of these services are monitored with Zabbix. Working to define the SNMP Trap at Fukuoka University made it possible to create a structure in which all of these different devices could be monitored. Also, one of the characteristics of FUTURE5 is that it is a dual-stack network with both IPv4 and IPv6 being used, and both of these are monitored by Zabbix. Currently, over 200 switches, 1,200 devices, and 43,000 items are monitored with Zabbix Server 2.2 on a virtual base. The structure does not employ a redundant configuration of Zabbix servers, but VMware vMotion is used in order to absorb problems at the virtual base side when they occur. After FUTURE5 went into full operation, there weren’t any major problems in particular. At first, there was the impression that the system would be easy to use once you become used to the visible interfaces that are difficult to deal with. Also, you could say that making fine adjustments during operation, such as by adding monitoring items and performing tuning, the occurrences of misdetection decreased. As one of the largest universities in western Japan, Fukuoka University carries on a history and tradition dating back 80 years, and continues to play a vital part in the region. The University’s large campus in the southwestern part of Fukuoka City incorporates a wide range of facilities, including the University Hospital. It is home to over 20,000 students in a diverse range of undergraduate (31 departments in 9 faculties) and postgraduate (34 majors in 10 schools) programs, and is the hub for a community of about 250,000 alumni. Fukuoka University is dedicated to holistic education, the cultivation of the whole person and the reintegration of knowledge through interdisciplinary education and research. In teaching and research, the university seeks to embrace both specialist and generalist approaches, nurturing both academic excellence and the highest ideals of the human spirit. In this way, The university strive to fulfill our mission of contributing to society by producing creative and spontaneous graduates who can think and act both locally and globally in pursuit of truth and liberty.